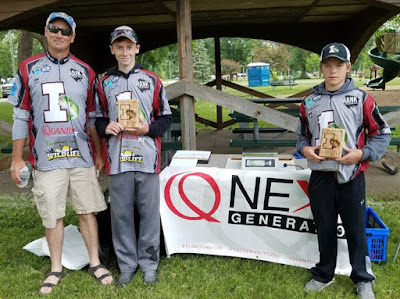 At my last tournament swimbaits played a key role in our victory. I have had several messages and calls about these baits, one that often gets over looked for bass fishing. Here are some more details in about swimbaits and how/when to use them. When fishing swimbaits it is vital to keep in mind that it is one of the most natural presentations you can use bass. Quality swimbaits are designed to mimic the natural forage; shad and minnows are the typical forage around here. When these baits are fished correctly with the proper rod/reel setup it can be a deadly weapon for bass. BAIT: The baits itself comes in a variety of styles, colors and sizes. Optimum Baits has the largest selection of swimbaits on the planet. There are two basic types of swimbaits; one being a direct tie to the bait, and the second being a "hook yourself" bait. The swimbait pictured at the top has a large paddletail, providing a lot of vibration and wobble in the water as you reel it in. These work particularly well when fish are aggressive. A similar type like the second one in the photo is much more of a finesse bait. It has a natural "dead fall" to it. 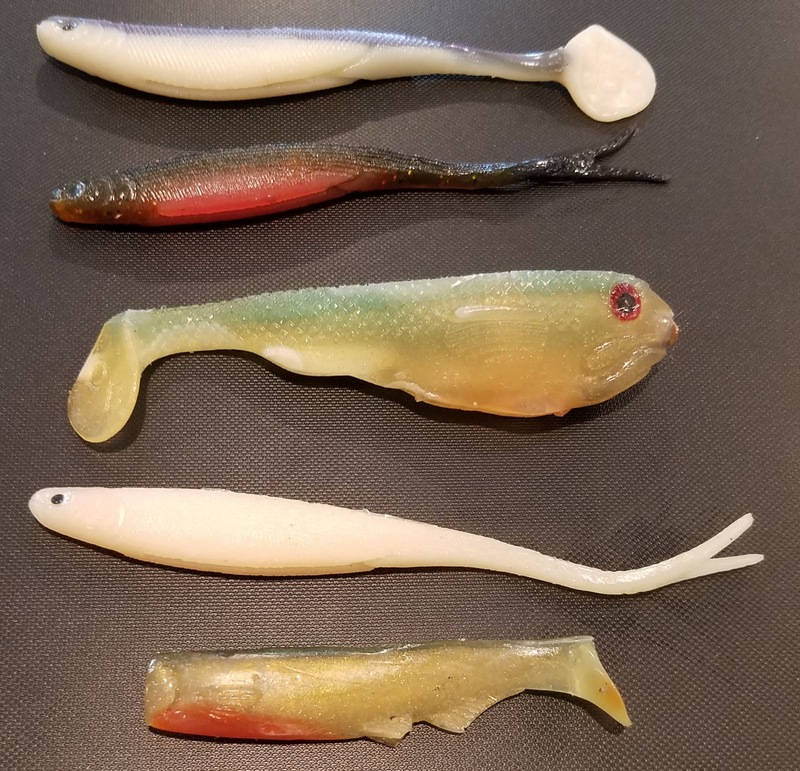 These baits are placed on a hook of your choice. I prefer using a 4/O or 5/O extra-wide gap hook. I also prefer using a heavy wire hook. This allows me to cast it much farther and not worry about the hook getting bent after several bass. Another key component to the proper hook is being flat on the top. The hook should come straight back towards the eye, this is vital to keep the bait sliding through and over weeds without getting snagged up, it also allows you to skin-hook the hook point. The third and last swimbait in the picture are direct tie-on baits. The middle one is a Line-Thru swimbait that has a treble hook on the belly, ideal for open water fishing. The last bait threads directly onto a matching jighead, again, ideal for open water situations. 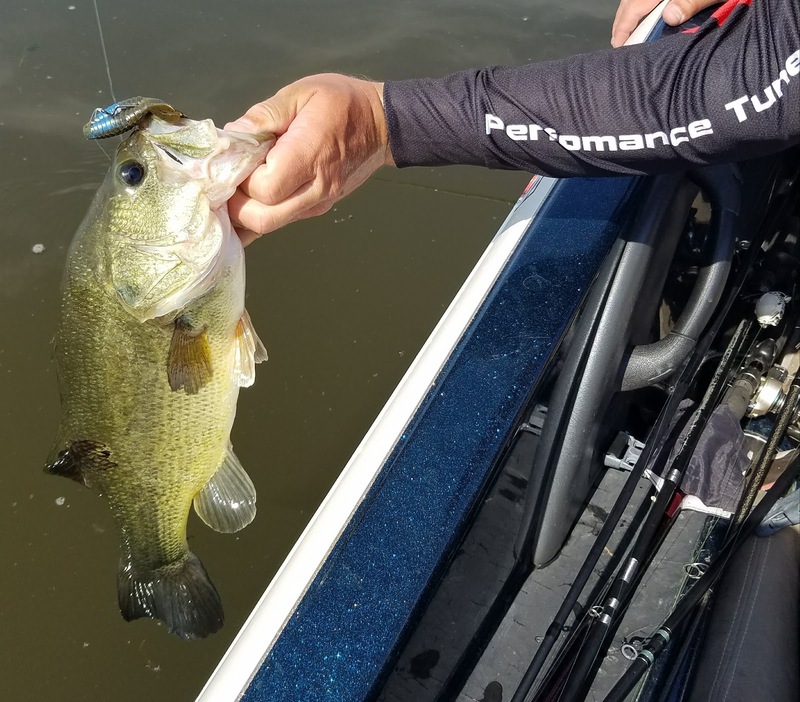 During this particular tournament on the Mississippi River the bass really liked the larger 5 inch swimbaits early, but by mid-morning the 4-inch baits were catching the bass. ROD/REEL: The combo that did most of the catching is pictured. It is a 7 foot Quantum TourPT Special Issue Rod. It is a Med/Hvy action rod with a fast action. This is paired with the Quantum Smoke reel, 7.3:1 gear ratio. I always throw swimbaits with braided line, this time it was 50# braid. With this combo I could throw the swimbaits well in front of the boat to inches of water and glide it through the scattered weeds. The bass were very shallow and making long casts was definitely a key to catching them. This rod/reel choice worked great to hook the fish and get them to the boat quickly before they could get entangled in the weeds and scattered trees and roots in the area. The location was key to catching many fish that day, however the combination of the rod/reel and the perfect bait mimicking the natural forage brought it all together for us. Just another day catching bass with Optimum Baits and Quantum Rods and Reels! On the way home from the first event of this series on Lake Sugema, I have been waiting for this weekend. Brian Bowles, from Marshalltown and I gave it our all on this event, after our disappointment at Sugema we were coming out swinging. We made arrangements a month ago to be on Pool 9 at sunrise on Thursday. With the tournament starting on Saturday, this gave us two days to search across Pool 9 for the right size of bass. Thursday took the boat to the southern half of the pool, by no means can you cover the whole thing in a day, but we ran around enough to see what we could do there come Saturday. We caught fish on a variety of baits, however location near rocks seemed to be key on this day. The first day of homework was done and now we focused our second day of practice on the northern section of the pool, some areas with previous good results this year, while a few I had not been to for several years. 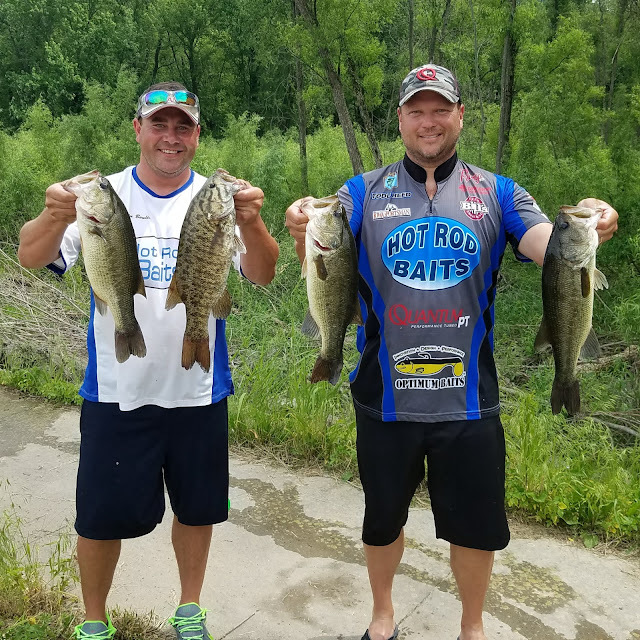 Again, Pool 9 is huge, (largest body of water in Iowa) it is over 35,00 acres, more than three times the size of Lake Rathbun, by no means can you cover it in two days, I haven't even covered it in 2 decades of fishing there! Obviously we picked and chose areas that we knew fish would be relating to this time of year. After the spawn on the river, the bass will get close to current and start to feed up once again...it is that time of year on the Mighty Mississippi River. At the end of the second day of fishing Brian and I had a good understanding of what we needed to do come Saturday morning at 5:30am. Saturday blast-off came with storms looming, we headed north to our first location wondering if the rain storms that occurred overnight would muddy up our fishing location. Upon arrival the water appeared to not have changed from the previous day, that was a good sign. We were fishing a stretch of river about 200 yards that had good current with laydown logs and some tree stumps. The first 90 minutes was a drag, only one keeper, we were very close to abandoning the area and head to our second spot. The storm passed in those 90 minutes and the sun started to peek out, and the bass started to feed. It was like a switch was thrown, it seems the fish needed some sun to find the minnows and shad they were feeding on. It was just what we needed. In the next 3 or so hours we threw a variety of baits at the bass, but a few were definitely the key to getting the bigger ones in the livewell. A small Optimum Baits swimbait, Hot Rod Baits stickbaits, and the IMA skimmer topwater bait proved to catch the big ones in this area. Having the correct rod/reel setup on these baits, and any baits that we used this weekend was crucial. QuantumPT makes a rod for any bass technique that you want to try. Having the right reel ratio on baits is important too, again Quantum PT is the only thing that we use, not only for the quality but the reasonable price as well. We caught around 15 keepers in the area along with several smaller fish too. We left the area with a little over 14# for our top 6 keeper bass, we both knew that wasn't going to make the cut come weigh-in time. We were off to more, similar areas to try and upgrade. A couple area didn't pan out and then things started to heat up for us with about 90 minutes left in the event. I hooked a good fish on a Wig's Jig and chunk which made our fist big upgrade of the day, the fish weighed just under three pounds and boosted us just over the 15 pound mark, a goal that we had and thought would put us in the top 5. A new area, and on the first cast made by Brian he hooked up with a big fish. He played it perfect in the current and the big smallie upgraded us another pound, we knew we had a little over 16 pounds for the event, a good feeling with only a few minutes left to fish. That smallie ended up being our biggest bass for the day, weighing in at 3.12#. 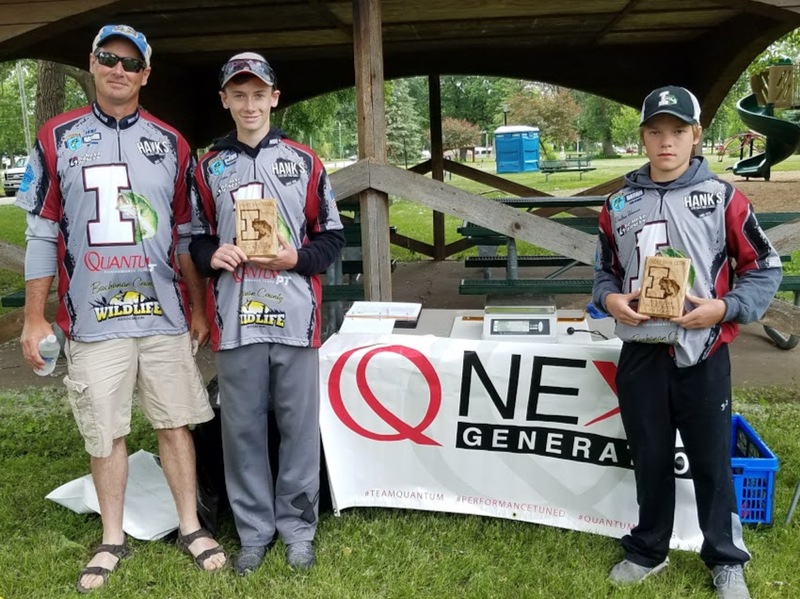 We continued to flip jigs and throw swimjigs in this particular area until our time was up and we had to start our drive south to the weigh-in. We felt we were "in the hunt" for the top 5. As the teams brought their bass to the scales it was apparent that our 6 bass were looking good. We ended up with the WIN, weighing in 16.42#. It was a great three days of fishing on the Mississippi River catching largemouth and smallmouth bass. I couldn't do this without the support of my kids and wife, they say they miss me when I'm gone and that is as good as any tournament win! Also these fine sponsors make everything easier; QuantumPT, Optimum Baits, Hot Rod Baits, Vexilar, Bill's Pizza in Independence, The Iowa Sportsman Magazine, and State Farm-Agent Tim Reed. Click on their links to the right for their great products! years with several finishes in the top 5. This was our first WIN. The morning of fishing started off great, it was a cool morning, which was a break from the close to 90-degree temperatures we saw most of the week. Anglers took off in every direction trying to locate largemouth or smallmouth bass that measured at least 12-inches to bring back to the live weigh-in at noon. A fast moving thunderstorm did greet the anglers early in the morning, but most didn't mind getting wet for their chance at catching some bass. The weather soon cleared and was once again mild and sunny by the noon weigh-in. The bass on the Wapsi have been a stressed out lately, temperature rises much quicker than normal, spawning rituals, and rising and falling water levels. The bass have not been easy to catch, however the Wapsi bass did not disappoint many of the club anglers. 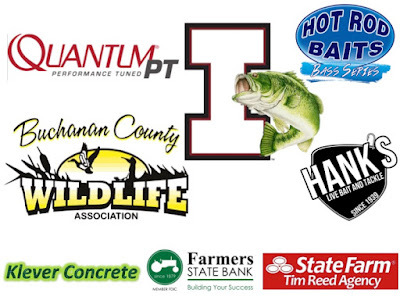 This event was sponsored by Klever Concrete, which provided money for the awards, DNR tournament permit and cool refreshments at the weigh-in. PROW donated some lures and snacks for the kids as well. The Big Bass award was a slightly used baitcasting rod and reel combo, graciously donated by my friend Chris Calkins from Marshalltown. Another great event for the kids of the Independence area. If you want more information about the club they are on Facebook and have their own WEBSITE with complete details of the events held and upcoming events.